It is so important to master these basics first before adding too much movement. I know if can be frustrating to have to SLOW DOWN and focus on the small things but these really are the key to a strong, functional body. Well this basic triad underpins everything you will do in a Pilates class. You can do all the moves without the magic trilogy and it will feel easy and like you’ve not worked. Add in the breathing, posture and core then suddenly it becomes a lot harder. Use the old parable of the foolish man built his house upon the sand and the wise man build on the rock. Lets say the house is your body. If you build on a good, solid foundation with a firm understanding of the breathing, a solid connection to your core and knowing how to correct your posture, then your body will get stronger and won’t fall apart when everyday stress is placed on the body. Think moving from sitting to standing, lifting, rotation movements and just bending down to the floor, all movements we do all the time that can impact the body if not done with good form. I’ve had to slow down and reconnect with the basics after every baby I’ve had. It’s really shown me how important it is to do this so I am a bit advocate of it, but also know the frustations with it. So if you are new to Pilates, it is perfectly OK to go at a slow pace, get to know your body, connect with your core, learn to breath and find out which parts of your posture you need to work on most. You will continually learn more about your body as you progress through the classes (heck, I’m still learning now) but those initial few months are precious ones, where you can form the best foundation. Practise the breathing daily, engage your core when breathing out and work on that posture between classes. You will click with it quicker if you practise more often. If you have done Pilates for a while it can be amazing to go back to the basics, really check you are using thoracic breathing (breathing into the ribcage and not the tummy), focus on your posture and the muscles you are using in each exercise and work that core even harder! Check it out and let me know, I would love your feedback. It’s that September time of new beginnings, which has led to more new Pilates enquiries and a flurry of activity in the studio. So we’ve some new Induction classes to help introduce people to Pilates and teach the basics before they join a class. One of the key things that people always struggle with is the breathing. I know it seems back to front, it did to me too. However the breathing really is key. Let’s face it, breathing full stop is key. The breathing in Pilates gives you stronger movements, more control and helps you focus. If Pilates was Star Wars I reckon the breathing would be “the light sabre” and the core would be “the Force”. Why is it so important? When you breath in the right way you work with your core. So you will get a more effective movement, work harder and see better results. Stress, everyday life and bad posture leads to people breathing into their belly or having their shoulders rise and fall as they breath. The type of breathing we are after in Pilates is thoracic breathing. This means breathing with the ribcage expanding and contracting. A good way to practise this is to tie a resistance band or folded towel around your ribcage. Alternatively place your palms with middle fingers touching, on your ribcage. As you inhale breath into the ribcage, you should feel it expand or push into the band with the breath. The diaphragm moves downwards. 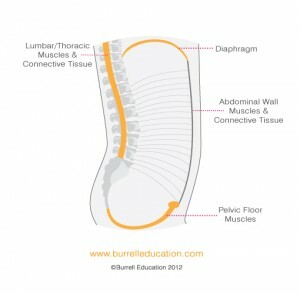 As you exhale let the breath come out of the ribcage, the diaphragm moves upwards and you will feel a tightening in your core (your lower abdominals will draw towards you and your pelvic floor will lift). You may have to exhale to the end of your breath to initially feel this. Once you tune into it, it will feel more intuitive. Click on the diagram to get a better look.